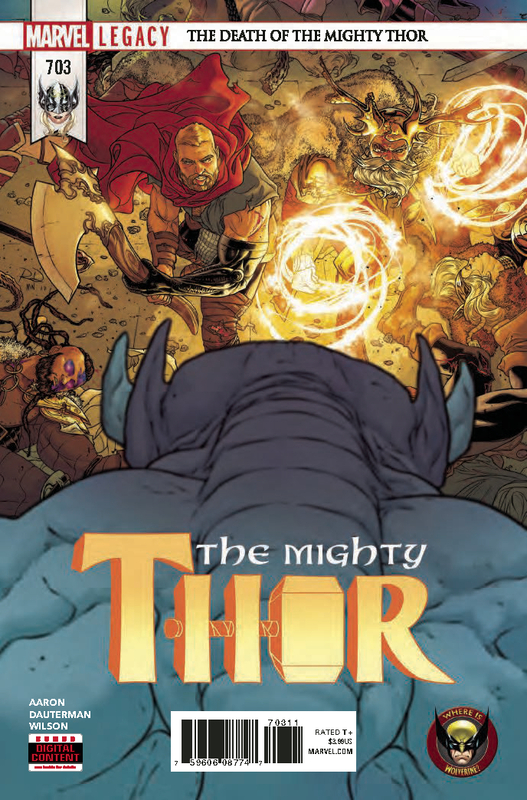 The Mighty Thor team continues to amaze. The Mangog has arrived in Asgardia, and it can only spell disaster for the gods, or a really frickin’ good book, depending on how you look at it. Normally, I save this for the end of my review, but I’m just going to tell you right now: go buy it. I’ll be keeping this spoiler-free so you can experience it for yourself. You can feel in every beat of this story how close we are to losing this Thor that we’ve come to love. The calmer moments of this book have a thick, ominous atmosphere of personal conflict that by themselves make this a great read. Even if we don’t lose Jane Foster, you just know something terrible is going to happen. Writer Jason Aaron is doing a phenomenal job of balancing those instances and the brutal beat-downs that are synonymous with the name, “the Mangog”. And there’s some seriously great, quotable stuff here. This book is something truly memorable, and the varied but always tremendously strong dialogue goes a long way in making it so. Not to mention, this book is an absolute joy to look at. I found myself taking much longer to read this than I normally would because I kept stopping to drool over what artist Russell Dauterman and colorist Matt Wilson have done here. Jane looks worse than ever, and yes, that’s a good thing. It makes it hard to root for her when she wants to take up the hammer, just building up that personal conflict for the reader so much more. These characters are so apparently invested in these struggles, and their facial expressions really tell you all you need to know. I would be able to tell what they’re going through without the dialogue. The way shades transition, some parts almost look like paintings. There’s really great comic book features on display, too; panels are diverse and never boring in their layout, which I personally can really appreciate. I hate when it’s strictly rectangles on each page. Sound effects demand your attention and simply won’t take no for answer. If you don’t like the way this book looks, I’d like for you to go get your eyes checked and try again.